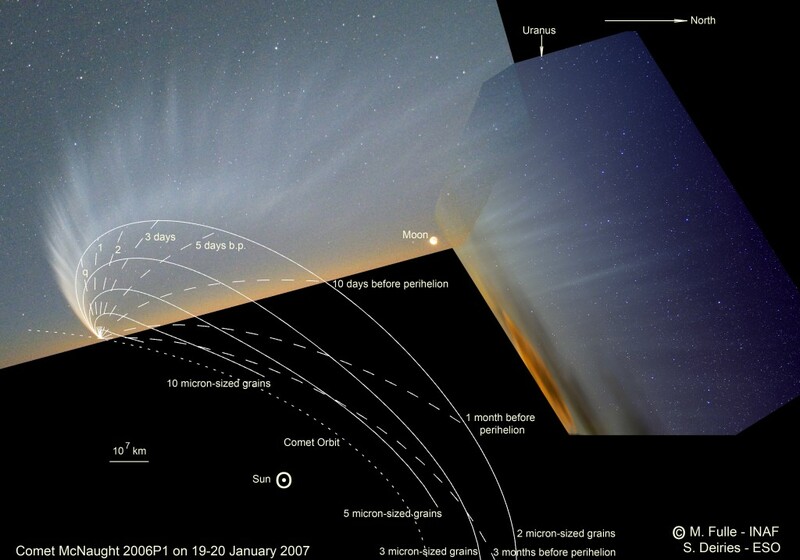 Explanation: By January 19/20 Comet McNaught's magnificent dust tail stretched for about 150 million kilometers (~1 AU), requiring images from both southern and northern hemispheres of planet Earth to take it all in. Two such views - from Cerro Paranal in Chile (left) and the Carnic Alps in Italy - are combined in this unique graphic that also outlines a perspective view of the comet's orbit (dotted line) and relative position of the Sun. Driven by solar radiation pressure the dust tail initially points away from the Sun, but also trails outside the comet's orbit. Astronomers try to account for the complex structure along the tail, including the pronounced striations, by considering forces acting on the dust (e.g. gravity, solar wind and radiation) as well as the release time and size of the dust grains. In the diagram, the modeled location of dust grains released at approximately the same time relative to perihelion passage, synchrones, are shown as dashed lines. The location of grains of similar size, syndynes, are shown as solid lines.